Rabbit anti Human, Mouse, Rat Exostosin-1. Fusion protein corresponding to C terminal 280 amino acids of human exostosin glycosyltransferase 1. Hereditary multiple exostoses (EXT) is an autosomal domint disorder characterized by the formation of cartilage-capped tumors (exostoses) that develop from the growth plate of endochondral bone. This condition can lead to skeletal abnormalities, short stature and malignt transformation of exostoses to chondrosarcomas or osteosarcomas. Linkage alyses have identified three different genes for EXT, EXT1 on 8q24.1, EXT2 on 11p11-13 and EXT3 on 19p, a family of tumor suppressor genes. Most EXT cases have been attributed to missense or frameshift mutations, which lead to loss of function of the EXT genes. 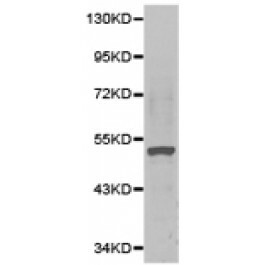 EXT1 is an ER-resident type II transmembrane glycoprotein and a heparan sulphate polymerase with both D-glucuronyl and N-acetyl-D-glucosaminoglycan transferase activities. Expression of EXT1 in cells results in the alteration of the synthesis and display of cell surface heparan sulfate glycosaminoglycans. EXT1 mutations have been identified in multiple types of human tumors.